Green bean casserole is a holiday meal favorite and a tradition in many American homes. The classic green bean casserole includes canned cream of mushroom soup. If you make your own sauce, however, you have much more control over the ingredients—choosing your preference of butter or oil, the type of liquid to add, and the thickener to use. In addition, the green bean casserole we’re all familiar with features a topping of crispy, deep-fried onions, usually from a can. Both of these pre-made ingredients add fat, calories, and preservatives to the dish. 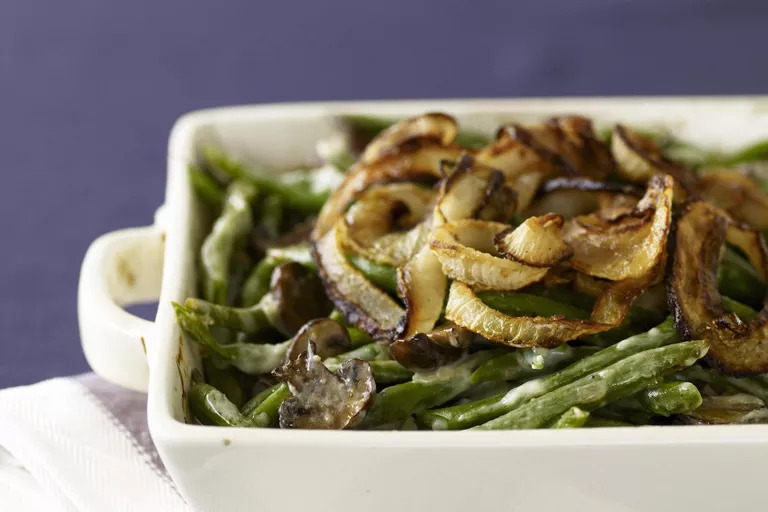 This recipe uses all fresh ingredients, and replaces the fried onions with sauteed, making this green bean casserole a much healthier version while remaining familiar and delicious. One thing to note, however, is that this casserole is not very saucy and may not satisfy all diners. Put half of oil in a skillet and add about 3/4 of the onion slices. Let them slowly cook. When they start to get soft, add salt and pepper. You want the onions to get soft and sweet, but if you let them cook down for a very long time they will start to lose too much volume. When they are soft, remove from heat and toss with almond meal. Taste and adjust seasonings. Chop up the rest of the onion slices and saute the mushrooms in the rest of the oil. Add thyme, stir, and add the thickener. Stir for another two minutes. In a measuring cup or small bowl, combine the milk with the cream; add to the sauteed onions and bring to a simmer for 1 minute. Mix in the beans and put in a casserole dish. Bake for 30 minutes. Spread the onions on top and cook for 5 more minutes or until topping begins to brown. Any type of “dairy” product works in this recipe. If you are watching your carbohydrate intake, the lowest carb count is in unsweetened soy milk. This recipe combines unsweetened soy milk and cream for richness, but you can use any fat level of milk you want to use, and any combination. Since cream adds some body and thickness, you may need to adjust the amount of thickener if you change the amount of cream. The type of thickener you use in this recipe is up to you as well. You can use any type of flour or other lower-carb thickeners such as guar gum and proprietary thickeners. 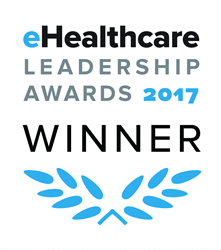 “We” can turn illness into “We”llness! This easy recipe for ground beef meat pie is low carb and keto. A crustless pie, this tasty meat pie is big on beef flavor and contains no starchy fillers. Preheat oven to 350 degrees F. Grease a 9-inch pie plate with olive oil and place it on a foil-lined baking sheet (to catch any drips while baking). In a large mixing bowl, whisk the eggs. Whisk in the kosher salt, garlic powder, onion powder, dried oregano and cayenne. Whisk in the Dijon mustard and the tomato paste. Set the egg mixture aside. Heat a large stainless steel skillet over medium heat. You can add some oil if you want, but I find it unnecessary as the beef releases quite a bit of fat. Add the ground beef and cook, stirring often and breaking it up as it cooks, until no longer raw but still slightly pink, about 5 minutes. Drain. Allow to slightly cool. Mix the cooked and drained ground beef into the egg mixture. Mix in 1 cup shredded cheddar. Transfer the mixture to the prepared pie plate, packing it in and smoothing the top and sides out. Sprinkle the remaining 1/2 cup cheddar on top. Bake until set, about 30 minutes. Let cool in the pan for 15-20 minutes before slicing and serving. It’s hard to imagine a bowl of pasta without the savory flavor of garlic. Besides being a staple in many Italian, Asian, and French cooking, it turns out that garlic is good for your health, too! Discover tasty ways to add this superfood to your meal plan with some of our best garlic recipes, and learn more about the health benefits of this healthful food below. Garlic is one of the oldest cultivated plants in the world and has been used for its medicinal qualities as far back as 2600 B.C. It is used to treat a plethora of ailments, including: arthritis, immune disorders, cataracts, cancer, strokes, and aging. Scientists believe that most of garlic’s superiority is due to its sulfur-containing compounds. Garlic contains close to 100 nutrients, but one in particular, allicin, appears to do the most good. Allicin is an amino acid that is not available when garlic is in clove form, but is released when the garlic is crushed, cut, or chewed. It is allicin that gives garlic its strong smell. In addition to allicin, garlic also contains phosphorous, zinc, potassium, selenium, polyphenols, and vitamins B6 and C. It is the total of all of these nutrients that makes garlic an excellent anti-inflammatory superfood! Put a large pot of salted water over high heat to boil for pasta. Season with sea salt and keep sauce warm over low heat. Drain the pasta and transfer into a large bowl. until the arugula has wilted. Divide the pasta into warm bowls and top with good quality grated parmesan. 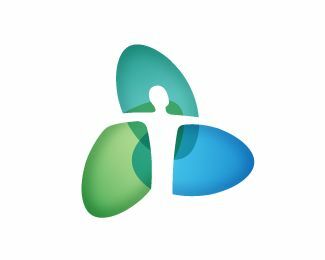 Everyone over the age of 40 has thyroid issues. 99% of the population! This is a smoothie that you can have everyday. Most smoothies with fruit and fruit juices, are not meant to have on a daily basis. This smoothie is filled with three basic ingredients that help regulate thyroid hormones: tyrosine to boost the thyroid hormone, greens to activate the thyroid hormone, and antioxidants to reduce inflammation in the body. Now you can create your own customized thyroid smoothie, all with the click of a blender! Place preferred tyrosine base, green base, and antioxidant base into blender. Add water and blend until desired texture is reached. Place a heatproof dish filled with 2 inches of water on the bottom rack of the oven and preheat the oven to 325°F. Lightly grease a 10 by 41⁄2-inch loaf pan with ghee or coconut oil. Line the bottom and sides of the pan with parchment paper so the ends hang over the sides. Combine the eggs, almond milk, vinegar, cashews, baking soda, and salt in a high-speed blender and process on low speed for 15 seconds. Scrape down the sides and then process on high for 30 seconds, or until very smooth. Add the coconut flour and blend again for 30 seconds. If the batter is too thick to blend, add up to 2 tablespoons water until it is moving easily through the blender. Transfer the batter to the prepared loaf pan. Bake for 60 to 70 minutes, until a toothpick inserted into the center comes out clean. Allow the bread to cool in the pan for 30 minutes, then gently remove the loaf using the parchment paper overhangs and allow to cool on a wire rack before serving or storing. Store the loaf tightly wrapped in parchment and cling wrap in the refrigerator for up to 5 days. To freeze – wrap the loaf tightly in parchment paper and place inside a freezer reseal able bag. Press all of the air out and zip it tight. Defrost in the refrigerator overnight. Kohlrabi: Is It Right For You? The Cool-Weathered, Out-of-This-World Vegetable and recipe. While most crops wither in frosty weather, the same cannot be said for kohlrabi (pronounced “cole-rah-bee”). Known for its bizarre appearance but extremely hardy nature, this unique cruciferous vegetable is certainly not lacking in flavor and nutrition, making it highly deserving of your attention (and a space in your pantry). Keep reading to discover more interesting facts about kohlrabi. Kohlrabi is one of the most versatile vegetables around. It can be cooked as you would carrots or turnips, and tastes great in salads, pies, or simply grilled or roasted. Kohlrabi can also be eaten raw (and this may be the best way of all to enjoy them). Don’t disregard the kohlrabi leaves – they’re edible, too. Kohlrabi greens can be enjoyed just like spinach, beet greens or collard greens, with a taste that’s reminiscent of kale and collards.11 They can be served cooked, either steamed or sautéed with other vegetables, or added raw to salads. It’s best to harvest them in early spring to ensure you get flavorful and tender leaves. Just like the diversity it offers in terms of culinary uses, kohlrabi offers a wide array of benefits for your body as well, owing to its various nutrients, as listed below. In terms of calories, kohlrabi should not be feared, as it only has 36 calories in every 135-gram serving. Kohlrabi also has phytochemical antioxidants that may have cancer- and inflammation-protective effects, and may help lower your risk of diabetes, heart disease, stroke, osteoporosis, Alzheimer’s and other diseases. “Kohlrabi’s chemopreventive effects makes it particularly healthy … Kohlrabi contains isothiocyanates which are effective against cancer. The chemopreventive compounds are more bioavailable from fresh–about three times as much as from cooked–kohlrabi. Although kohlrabi plant benefits from sunlight, brand new seedlings may need some shade, especially if the weather is hot. When planting kohlrabi seeds, make sure they’re one-fourth to one-half inch deep in the ground, with 6 to 8 inches of space in between. Do not overcrowd them, as this may cause the plants to compete for nutrients and may also block the sunlight coming in. This will delay the formation of the bulbs. Kohlrabi should be free of weeds and consistently well-watered. If not watered enough, the plants may become stressed and will not produce bulbs. Kohlrabi should be harvested at their prime – don’t wait for them to become overgrown. It usually takes six to seven weeks for a kohlrabi plant to reach maturity. Once harvested, kohlrabi leaves and bulbs should be kept in the refrigerator, where they will stay fresh for at least a few weeks. Whether mashed, sautéed, grilled, roasted, kohlrabi is certainly one of the most versatile vegetables you will come across. Kohlrabi salad and soup recipes are becoming popular today, mainly because this cruciferous vegetable works great in these dishes. Different cultures around the world also have different ways of cooking kohlrabi, making use of this crop in various creative ways. In a large bowl, mix the kohlrabi, carrots, cabbage, onion, cilantro and raisins (if using). In a smaller bowl, whisk together the cider vinegar, mayonnaise, salt and honey. Pour the dressing over the slaw, and mix until all the ingredients are fully coated. Chill for several hours before serving. While cooking kohlrabi leaves and bulbs may seem like a great idea, remember that they retain most of their nutritional value when eaten raw. Simply peel, slice, and sprinkle the bulb with salt, and then eat it raw. As for the leaves, use them as a replacement for your typical salad greens. Try bringing berries into your regular diet if you have any illness or symptom, including high cholesterol, ovarian cysts, irregular menstruation, brain cancer, amyotrophic lateral sclerosis (ALS), stroke, Parkinson’s disease, Alzheimer’s disease, dementia, attention-deficit/hyperactivity disorder (ADHD), autism, encephalitis, epilepsy, Huntington’s disease, narcolepsy, osteomyelitis, Tourette’s syndrome, cerebral palsy, multiple sclerosis (MS), atherosclerosis, heart disease, ovarian cancer, atrial fibrillation, prostate cancer, polycystic ovarian syndrome (PCOS), mystery infertility, endometriosis, obsessive-compulsive disorder (OCD), acne, weight gain, bladder infections, fibroids, hypoglycemia, psoriasis, adenomas, edema, thyroid nodules, hot flashes, sensations of humming or vibration in the body, headaches, nerve pain; mineral deficiencies, frozen shoulder, panic attacks, phobias, brain lesions, jaw pain, anxiousness, scar tissue, Candida overgrowth, back pain and if you are female. As you eat berries, reflect on the abundance of berries available year-round and how they grow on bushes low to the ground so we can easily pick them and share in them with animals also in need of nourishment. The selfless nature of berries help us to also become more generous, kind, and selfless in turn. Beautiful and enticing, these berries-and-cream bowls are perfect for brunch, entertaining, or dessert. The coconut milk whips into a cloud of light, fluffy whipped cream, and the hint of ginger and lemon zest completes the dish. Enjoy impressing those you love with these beautiful berry bowls. Rinse the berries, mix them together, and divide them evenly into 2 bowls. Open the cans of coconut milk, being careful not to shake them. Coconut milk naturally separates in the can, leaving a thick, heavy layer on top. Scoop out the solid cream from each can and place it in a small mixing bowl. (You will need ½ cup of cream.) Discard the thin liquid that remains. Using a fork, whisk together the coconut cream, ginger, maple syrup, lemon juice, and the scraped seeds from the vanilla bean pod. Whisk until the mixture is well combined and smooth. 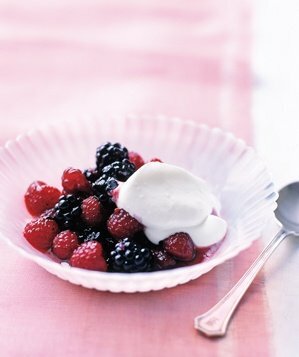 Scoop a generous dollop of cream over the berries in each bowl. Top with the lemon zest and mint. Place mushrooms and onion in a 3-qt. slow cooker. Sprinkle beef with salt and pepper. In a large skillet, heat 1 teaspoon oil over medium-high heat; brown meat in batches, adding additional oil as needed. Transfer meat to slow cooker. Add wine to skillet, stirring to loosen browned bits from pan. Stir in broth and Worcestershire sauce; pour over meat. Cook, covered, on low 6-8 hours or until meat is tender. In a small bowl, mix cornstarch and cold water until smooth; gradually stir into slow cooker. Cook, covered, on high 15-30 minutes or until gravy is thickened. Serve with mashed potatoes. Yield: 4 servings. This Low-Carb and Sugar-Free Coconut Macaroon recipe is very easy to make. There are only four ingredients, which mix up easily, and require only 15 minutes to cook. The only trick, especially when not using sugar (which attracts moisture), is keeping them from being too dry. Here’s how I do it. Grind the almonds using a food processor and combine all ingredients in a small bowl. Mix well. Scoop out 1 tablespoon of batter at a time and place on a sheet lined with parchment paper. You should get about 15 tablespoon sized macaroons from the ingredients listed above. Bake at 350F for 12-15 minutes. Let cool before eating. Makes about 14-15 cookies, but yield will vary based on size of the cookies. Macaroons: Macaroons are cookies made with a combination of egg whites, usually coconut (although almonds and other variations exist), and vanilla. The cookies are easy to prepare and bake. Macarons: Macaron cookies are delicate cookies made with almond meal (the same thing as finely ground almond flour), sugar, egg whites sandwiched together with ganache, buttercream, caramel or fruit fillings. The only coconut you might find in a macaron is in the filling. Elderberries are healthy, delicious way to keep your family healthy during the cold winter days. Your kids might love elderberry syrup and elderberry gummies, but there’s another thing you can give them to boost their immune system and provide extra soothing effects for their sore throat. We talk about tasty, immune-boosting elderberry popsicles which will become one of their favorite treats. One study conducted on flu patients proved that elderberries provide strong antiviral effects which protect from flu better than a flu shot. This popular flu remedy recovered the participants twice as faster as those from the placebo group. In just 2 to 3 days, almost 90 percent of the group treated with elderberry have recovered completely, as oppose to the placebo group which took a minimum of 6 days for a complete recovery. It has been shown that a dose of Tamiflu can only alleviate your symptoms by one day. But, what’s worse is that children are more prone to its side effects than adults. Some Tamiflu users have reported side effects like delirium, sudden confusion, unusual behavior, hallucinations, or self-injury, most of which have occurred in children. On the other hand, elderberries are natural remedy with no side effects and a sweet taste. You can see why they are the clear winner here. Besides elderberries, these throat soothing popsicles contain blueberries. These antioxidant rich berries are rich in vitamin C which helps fight cold and flu symptoms, and protects the lungs during the flu. Besides vitamin C, blueberries also contain vitamin K and manganese, all of which provide antioxidant properties which improve the cough symptoms and prevent advancing into pneumonia. You can add natural sweetener such as raw honey as it provides antibacterial effects and many other benefits. That’s why it’s often used as a sore throat remedy. But, if your kids are younger than 1, substitute the honey with maple syrup, or avoid it completely. It’s also recommended to supervise them while eating the popsicles. As these popsicles don’t contain much fat and sugar, another ingredient you can use is grass-fed gelatin to prevent them becoming rock hard ice bricks. What’s more, gelatin is excellent for your joints, skin, hair, and nails. You can also include coconut water instead of just using elderberry infused water. Your kids will love the sweet taste it gives, while getting enough electrolytes at the same time. Getting electrolytes is especially important during sickness and vomiting, as your body loses great amount of electrolytes in these conditions. Choose brand that doesn’t contain added sugar and is minimally processed. Last but not least, use some lemon juice whose acidity will balance out the sweet flavor from the other ingredients. What’s more, it’s a great source of vitamin C – a vitamin that isn’t produced naturally in our body, which is especially important during illness. Here’s how to prepare this healthy treat, or cold and flu remedy. Mix the water and elderberries in a small saucepan. Bring to a boil, and simmer for 15 minutes on low heat. Strain well using a cheesecloth or a fine mesh strainer to get all the juice out. Pour the strained juice in a clean saucepan. Add the grass-fed gelatin and leave it for several minutes to absorb. If you plan to use a thick honey, add it right after the gelatin gets gelled a bit. Then, bring the saucepan with this mixture over a low heat, and stir slowly until it’s melty and well-combined. Be careful not to overheat, as the honey will no longer be raw. Blend the blueberries and the coconut water in a blender until smooth. If you don’t have coconut water or coconut juice, you can substitute with any herbal tea, juice, or even plain water. Add the blended mixture and the rest of the ingredients to the mixture with elderberries, and stir well. Once it’s well combined, pour the mixture into some popsicle molds, and put them in the refrigerator. Let them firm up, and then enjoy! You can always double the ingredients to get more popsicles. Note: If you blend all ingredients together, you’ll get a foam which doesn’t freeze into popsicles well.